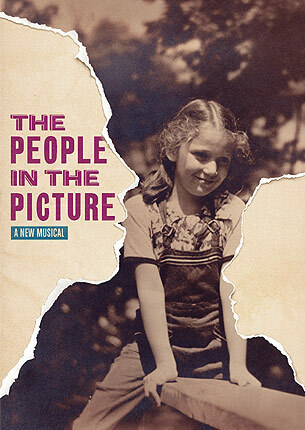 The new musical The People In The Picture is all about family. And like most families, it’s often difficult to understand and lays heavy on the guilt. 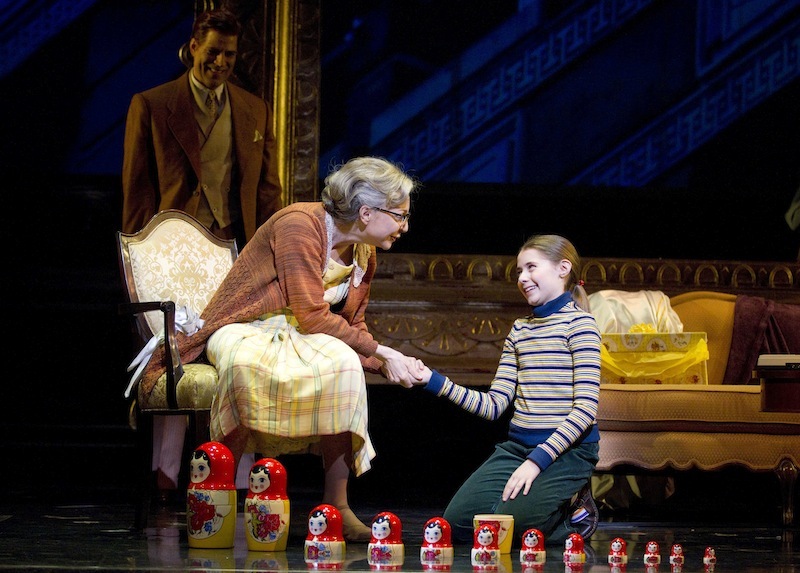 Donna Murphy stars as Raisel, who is more commonly referred to as Bubbie by her doting granddaughter. Raisel recounts stories to her granddaughter Jenny (an irritating Rachel Resheff) of her days as an actor in a Yiddish theater troupe in Warsaw, Poland. Despite being unable to talk about anything but the past, Raisel aggressively resists any memories her daughter Red (Nicole Parker) attempts to discuss, which is where the story’s haziness begins. Through her avoidance and weakened voice, we see that Raisel is haunted by her past—quite literally, actually, as the spirits of her dead friends visit her. Nothing like being beaten over the head with a metaphor. Raisel is getting pretty old (judging by Murphy’s performance, I’d say about 126) and she’s losing her wits. Red finds it unacceptable for a senior citizen’s mind not to be as sharp as a tack, so she starts researching retirement homes. Raisel rails against her daughter’s suggestion with rage, as the mere idea reminds her of being put into a Nazi concentration camp. Ah, here come the memories that Raisel is trying to escape. The story swerves in and out of Raisel’s past during Nazi-occupied Poland and the present day, which in this play is 1977. The transitions are abrupt and even stack up on each other. One moment the story is in the present with the 1970s characters, then it’s in the past with the 1940s characters, and sometimes the 1940s cast is talking in the present. No wonder Bubbie gets confused! The People In The Picture is part Holocaust drama, part “What-do-we-do-with-mother?” family soap opera. Neither reaches a level of poignancy necessary to keep the musical afloat. After so many Holocaust stories put to film, they now usually need to resort to shocking imagery to make a mark. Here, things stay pretty PG. As for the story’s more contemporary half, book writer Iris Rainer Dart makes cheap moves to ensnare the audience’s sentiment with sure-fire family weepies. Ill grandmothers? Pleading, teary-eyed granddaughters? Let’s kick some puppies while we’re at it. The bright spot of Picture is found in Murphy’s performance, marvelously transitioning between the vibrant young woman she was and the crusty crone she’s become. She literally goes from dancing in a lively production number to spinning around and facing the audience a second later with a scarf on her head and a hunched posture. Murphy is quite sensual with her lover Chaim (a wooden Christopher Innvar) and equally as endearing with her granddaughter. While her role may be tedious, Parker (who has a striking resemblance in looks and mannerisms to Anne Hathaway) does an admirable job as the worrying Red, illustrating the concern that plagues any adult watching their parent slip into senility. Joyce Van Patten as Raisel’s friend Chayesel has some snappy one-liners, although some have inappropriate placement. (Hey, she didn’t write the lines—she just has to say them well.) Louis Hobson shows up to play the exact same doctor he played in Next to Normal (if it ain’t broke…). Lewis J. Stadlen and Chip Zien do their best to portray every Jewish stereotype in the book with campy ambition. For such a schmaltzy story, you’d think there’d be some catchy, saccharine music to accompany it. However, the score by Mike Stoller and Artie Butler (yes, from that Leiber & Stoller—the team that wrote “Hound Dog” and “Stand By Me”) fails to churn out one memorable melody. Most of the songs bring the show to a thick standstill, and it wouldn’t have been a bad idea to turn Picture into a straight play. There’s an attractive set by Riccardo Hernandez, which uses a massive gold frame that traces the proscenium. It’s ornate detail and tilted angle make for a striking sight, especially when you start to imagine the giant frame falling into the audience (it’s really tilted). Hernandez goes a bit frame-crazy as the production plows on (this show really loves its metaphors), but they serve a nice, abstract purpose. Elaine J. McCarthy has created a useful projection design, with a large area used on the stage’s back wall, large so everyone can see it. And since Raisel’s acting troupe also made films, there’s some creative camera tricks used to combine the actors with the video projections. A melodramatic trip through the family photo album can feel like a chore when the storytelling is unclear and the past makes unwelcome entrances into the present. Still, The People In The Picture tries hard to be a three-hankie heritage story, and does hit some emotional chords. I just wish those moments felt more genuine and less like a sucker punch. When the box office opens, up to two tickets may be purchased per person for $22 each. I guess professional reviewers don’t like to be “moved” emotionally. Everyone I know that has seen this show laughed and cried, and cried and laughed. It didn’t have the chorus line of “Catch me if you Can” and I didn’t see any of the dancer’s underpants. In fact, this play actually required some thought, not just sit back and be entertained. This is a beautiful, intelligent musical that everyone should see. Thank you for your thorough and accurate review of this show! It was PAINFUL to sit through! The songs all sounded alike, the lyrics and most of the jokes were predictable, it was too emotionally manipulative, the “love story” came out of nowhere, and don’t even get me started on the child acting. . . or the huge frame on the stage, as well as the other smaller frames that made up the set (we get it–frames = picture!) I definitely see why Donna Murphy was nominated, as she acted the hell out of a lazy story, and sang the hell out of a lazy score (the same could be said about most of the performers), but overall, it was not a great theatre experience. I saw the show last night and after hearing terrible things, I couldn’t help but think that everyone was being too hard on it. I liked that the score was done in the style of Yiddish music, which is something rare for a Broadway musical. Remind me that I want to talk to you about this show in person the next time I see you because there is more that I want to say, but it would be better in a conversation than just a comment here.